In 2012, Foster & Banks Walk in Faith Foundation, a nonprofit organization that promotes environmental awareness, accountability and responsibility to the community, along with then 7 year old Kirsten Chavis, created a GO GREEN Youth Earth Club made up of students who attended both Lou Dantzler Elementary School and Budlong Elementary School. Led by President Kirsten Chavis, the club host annual Earth Day Community Events, and engages in service projects each year that benefit the planet and their communities (http://www.gradesofgreen.org/biographies/kirsten-c). In 2015, The Pollination Project, a nonprofit organization that gives $1000 a day, every day, to individual change-makers and activists, awarded a $1,000 grant to Kirsten to support her with her environmental advocacy efforts! On Saturday June 17th, 2017 between 2:30pm-5:30pm, these two environmental stewards are leading their peers, teachers, parents, and community members in a block by block neighborhood clean-up! 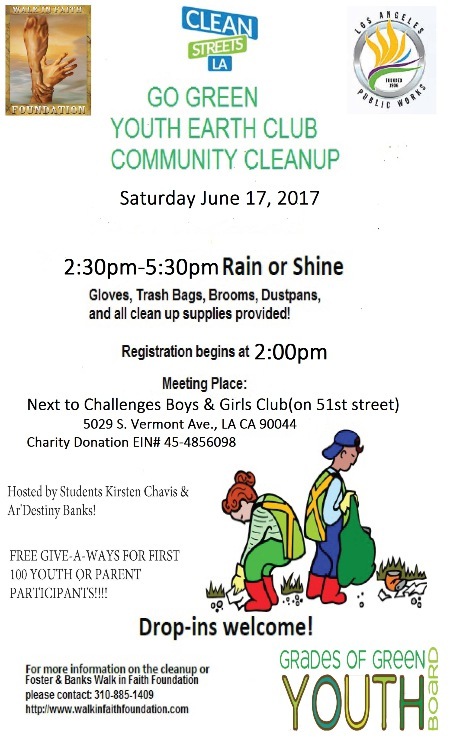 Meeting at the Challengers Boys & Girls Club, located at 5029 S. Vermont Ave., LA, CA, 90044 at 2:00pm, volunteers will pick up litter between Slauson Ave., and Vernon Ave., and Normandie Ave., and Vermont Ave in an effort to help Beautify Los Angeles with a goal of collected 75 bags of Trash off the streets! This not only benefits the neighborhood, but the planet as a whole! Last month, Kirsten Chavis and Ar’Destiny Banks showed the world that kids indeed have the power to make change, hosting a Beautification Event that led to over 90 Volunteers coming together on May 21st to clean the streets. These volunteers tirelessly collected over 60 huge trash bags of litter, painted a mural of unity, peace and compassion on the corner of Budlong Ave. and Slauson Ave., and constructed 6 small mobile gardens with flowers, herbs, and vegetables donated to Budlong Elementary School and ICEF Lou Dantzler Prep Academy!